On the Indonesian island of Bali, music and dance are deeply ingrained in people’s daily chores and rhythms, effortlessly blurring the lines between work and leisure. Before going to school in the morning, children stop by the village center to play gamelan -- the traditional ensemble music of Java and Bali that mainly comprises percussion instruments. 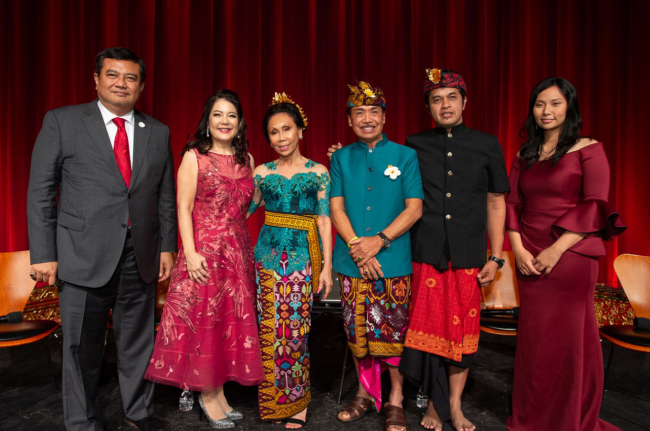 Indonesian Ambassador to South Korea Umar Hadi has always had a keen interest in Balinese culture and heritage. As the consul general in Los Angeles from 2014-2017 he had the chance to help create a documentary feature film on the subject. 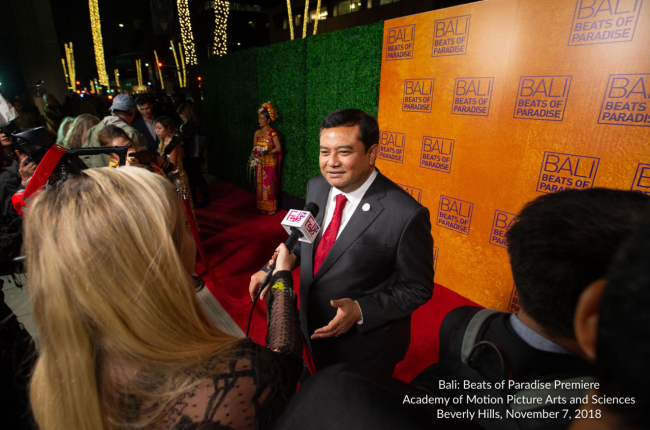 “Bali: Beats of Paradise” pulls back the curtain on gamelan and introduces Nyoman Wenten -- a celebrated Indonesian composer of gamelan and professor of ethnomusicology at the California Institute of the Arts, who sets out to pay homage to the sacred tradition of Balinese music and dance. 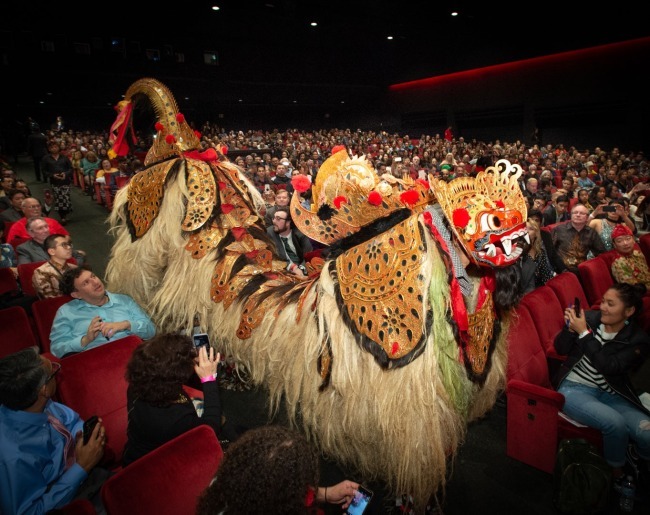 The hourlong documentary was created by director Livi Zheng with Hadi as executive producer. It also features Grammy-winning singer Judith Hill, who engages in a musical exploration with Wenten. Hill and Wenten created a music video that later developed into the film by blending funk and gamelan, shooting it in Southern California’s Joshua Tree National Park. The video illuminates the stark contrast between the desert and colorful Balinese costumes and sounds. The film premiered in Los Angeles and New York in November, and Hadi is working to showcase it in Korea. The Seoul premiere will take place Thursday at 2 p.m. at the National Museum of Korean Contemporary History. The envoy launched gamelan classes for the public every Saturday at the embassy in September 2017. Noting he likes to play the gong, Hadi said gamelan had a “smoothing” effect on his mind. If Indonesian and Korean musicians were to work together to fuse gamelan and K-pop, he said, the results would prove hugely popular on both sides. Gamelan is dominated by percussion instruments, including the metallophone, kendhang, xylophone, bamboo flute, rebab and sindhen. The genre predates the Hindu-Buddhist culture that thrived in Indonesia millennia ago and developed into its current form from the late 13th through early 16th centuries. In modern times, gamelan has influenced Western contemporary, romantic, avant-garde and jazz music as well as Japanese contemporary, leaving unmistakable traces in the works of composers Claude Debussy, Erik Satie, Bela Bartok, John Cage, Don Cherry and Ryuichi Sakamoto, among numerous others.